The Dales Way is a delightful 78 mile walk through the Yorkshire Dales from the moors of Ilkley through the wonderful limestone country of Wharfedale and Dentdale and then skirting the Howgill Fells as you head west into south Lakeland to finish at the charming town of Bowness-on-Windermere, the largest lake in England's premier National Park. Walking the Dales Way in 6 stages is an option for anyone used to long distance trail walking. Our itinerary gives an average day of around 12 - 14 miles with one longer day from Buckden to Dentdale. We have kept the last day shorter to give time to enjoy the lakeside at Bowness or for the option to return home on this day (deduct £50pp if no overnight in Bowness). Arrive at Ilkley and check in. Walking the Dales Way in 7 stages is our recommended option with a daily mileage of around 10 - 12 miles. Given the nature of the walking which is mostly along rivers and canals and through low valleys, this is quite a pleasant pace with time to enjoy and look around the places you are passing through. 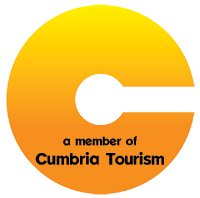 Our price for this option includes a night in Bowness / Windermere but if you wish to return home on the same day you end the Dales Way, this is also possible (deduct £50pp if no overnight in Bowness). For anyone with more than just a week to devote to this beautiful walk, it is well worth taking your time over the Dales Way. This itinerary will allow plenty of time to get the best out of the sightseeing possibilities along the route and enjoy a relaxed pace on a trail with ample opportunity to sample village pubs and quirky cafes. ILKLEY: There are frequent trains to Ilkley from London (Kings Cross) taking approximately 3 hours, from Manchester (1½ hours) and from Glasgow (5 hours). RETURN from WINDERMERE: There are frequent trains from Windermere to London (3½ - 4 hours), Manchester (1½ - 2 hours) and Glasgow (2½ - 3 hours). We do not recommend driving to the start of the Dales Way as the return journey by train from Windermere will take 3 - 4 hours and involves several changes of train. The Dales Way mostly follows river valleys and is therefore less strenuous than trails such as the Pennine Way or Coast to Coast. It is a good trail to choose if you want an introduction to Long Distance Path (LDP) walking. Depending on where you look for information, the trail length varies from 75.5 miles (the distance as measured on the 1:25000 Ordnance Survey map) to 81 miles (the distance given on most of the route signage). 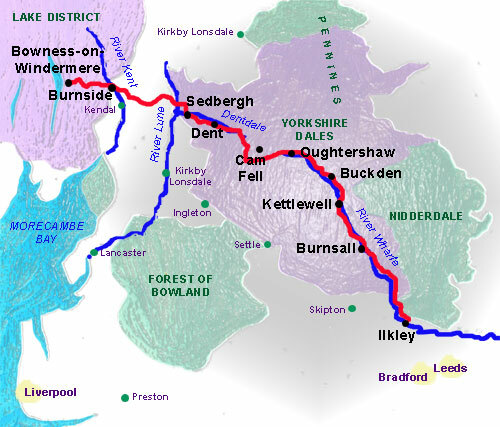 The distance for the route given by the Dales Way Association is 78 miles. This is relatively short for a long distance trail and means that it can easily be completed within a week.